Immunological analysis is important for detection of various kinds of antigens (e.g. protein). Immunological analysis can be divided into two groups. Firstly, methods that utilize membranes or plastic plates to immobilize antigens (e.g. western blotting, dot blotting, and enzyme-linked immunosorbent assay [ELISA]). Secondly methods that directly detect antigens on tissue sections or cells (e.g. immunohistochemistry [IHC] or immunocytochemistry). With immunological analysis, sensitivity, specificity, and background noise are commonly encountered problems. Our "immunoreaction enhancing technology (IE technology)" is based on acceleration of antigen-antibody reaction whilst keeping high specificity and low background. This technology is applied to the Can Get Signal® (Code No. NKB-101) and Can Get Signal® immunostain (Code No. NKB-401) series. Can Get Signal® (Code No. NKB-101) improves sensitivity, specificity, and signal-to-noise ratio (S/N) for western blotting, dot blotting, and enzyme-linked immunosorbent assay (ELISA), etc. Fig. 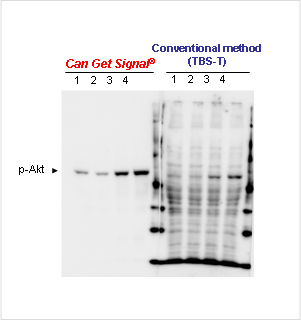 2.Detection of phosphorylated protein kinase (p-Akt) by western blotting with Can Get Signal ® and a conventional method. This data was provided by Dr. Yanagawa of Miyazaki University. 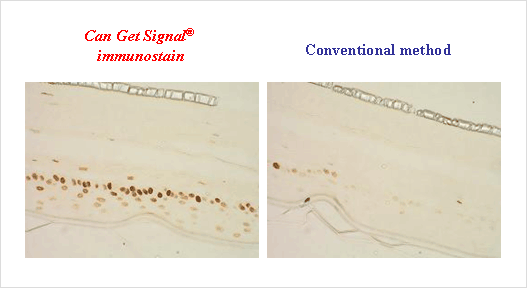 Can Get Signal® immunostain (Code No. NKB-401) is a reaction solution that contains an accelerator for antigen-antibody reactions, which improves sensitivity, specificity, and S/N of immunohistochemistry (IHC) and immunocytochemistry. Fig. 4. Detection of proliferating cell nuclear antigen using ABC method with Can Get Signal® immunostain and a conventional method.